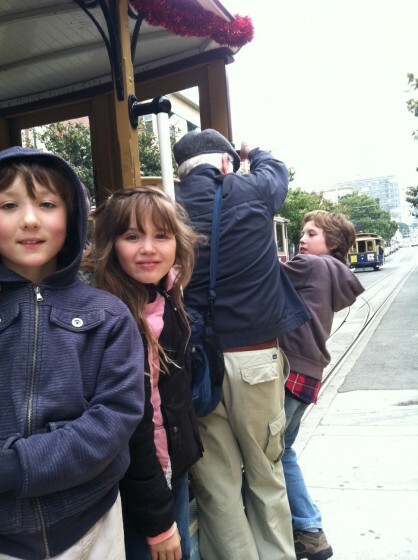 L to R: Emerson, Vienna, Jerry and Elliott at Fisherman’s Wharf, ready to travel over the hill to Market Street. Better make room for Grampa, Elliott! 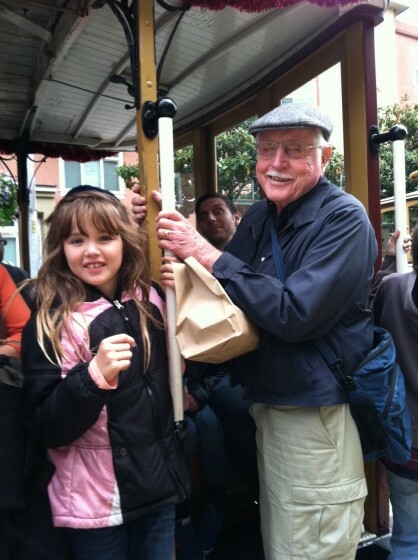 When Jerry found out that his grandchildren had never been on a cable car ride, well, he had to remedy that. 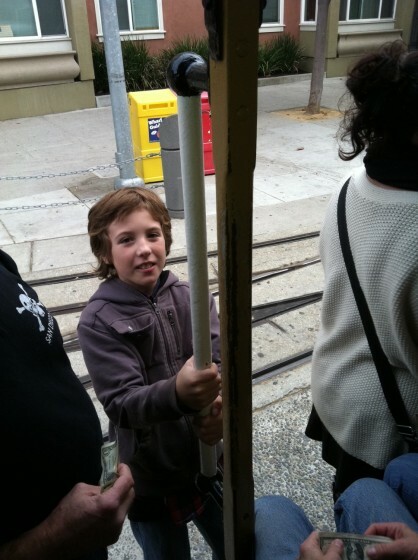 We rode from Union Square (waiting at Powell and Market is for tourists only) to Fisherman’s Wharf and they loved it. On the ride over it was crowded and they had to sit. They were crushed that they couldn’t hang off the side but those spaces were already occupied. Isn’t Jerry the most adorable grampa? 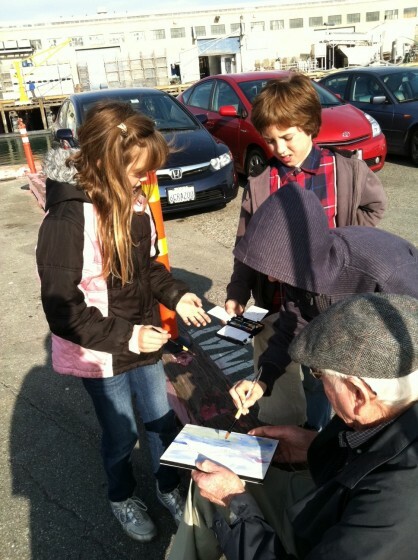 After lunch at Fisherman’s Wharf, Jerry got the kids involved with a collaborative painting of the fishing boats. Each child helped with the painting, from start to finish. The final result was charming. Emerson paints his fishing boat while Elliott critiques. Sorry you can’t see how lovely the painting is. 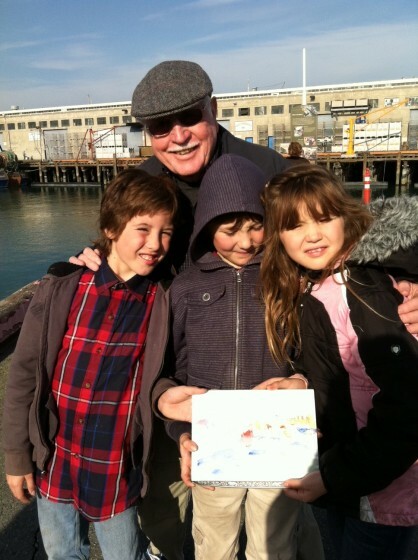 I was focusing on those adorable kids and their grampa. 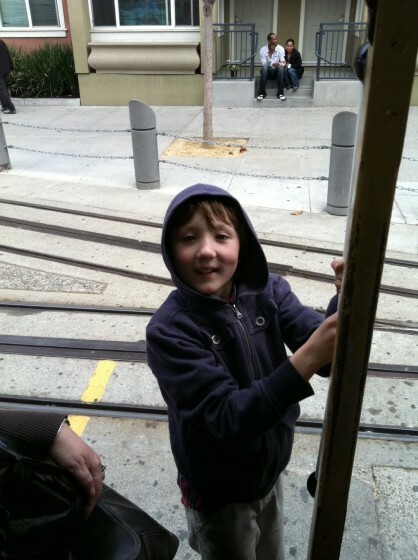 Although we have ridden cable cars before, it was a whole new experience to see it through the kids’ eyes. It’s really a fun thing to do.